The doctype XHTML 1.0 Strict is set correctly. 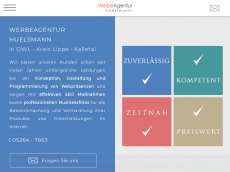 Test up to 1.000 webpages of werbeagentur-huelsmann.de with our free plan! This page contains 734 words. That's ok.
38% of the text are stop words. 15 paragraphs were found on this page. The average number of words per sentence of 15.69 words is good. A viewport "width=device-width, initial-scale=1.0, maximum-scale=1.0, user-scalable=no" is provided. H3 Profitieren Sie von unseren umfangreichen Angeboten! There are 14 external links on this page. This website redirects to "https://www.werbeagentur-huelsmann.de/"
This website is very well linked from other websites. This website has backlinks from 27 referring domains. This website has 3,012 backlinks. This website has backlinks from 23 different ip addresses.